With CPG-Shell, an application (online or batch) running on an IBM System z server can start a program on another platform and can transfer mainframe data to this program. A special case of CPG-Shell is the CPG-SAP-Shell. With the CPG-SAP-Shell, an application (online or batch) running on an IBM System z server can transfer data to an SAP system via the Business Application Programming Interface (BAPI). 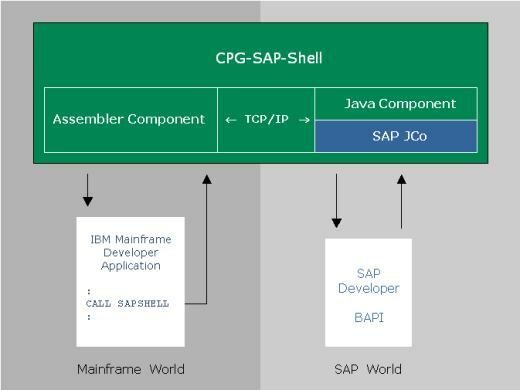 To do this, a mainframe developer calls CPG-SAP-Shell from an application and enters the name of the specific BAPI object to be used and the data to be transferred. For online applications, this is done over the Common Area; for batch, through the CALL parameter. Nothing else needs to be done! An Assembler component effects the transfer by communication with a Java server program. Using TCP/IP, it sends the data from the mainframe application to the Java program. Likewise, it routes any return variables to the application. A Java component running on the SAP systems receives the mainframe data and calls a specific BAPI object using JCo, the official SAP connector for communi-cation between Java programs to SAP systems. CPG-SAP-Shell is thus a simple, effective way to transfer data from a z/OS or z/VSE program to a BAPI object in an SAP R/3 or mySAP Business Suite landscape. Participants rate our 46th COURSE conference with a top grade of 1.2! Handouts can be found in our german download area. CPGJDBC is a daemon, that enables CICS and batch programs to process data on other platforms.